I am getting ready to have a massive garage sale at the end of next month. I have two great girlfriends and we have decided to do joint garage sales twice a year. One has a neighborhood sale in the spring, the other in the fall! Works out perfectly. When we did it this spring - we kinda just threw it together at the last minute, but we had a good sale considering it rained buckets. This time - we are taking a little more planning and our leanings from our spring sale to really knock it out of the park! 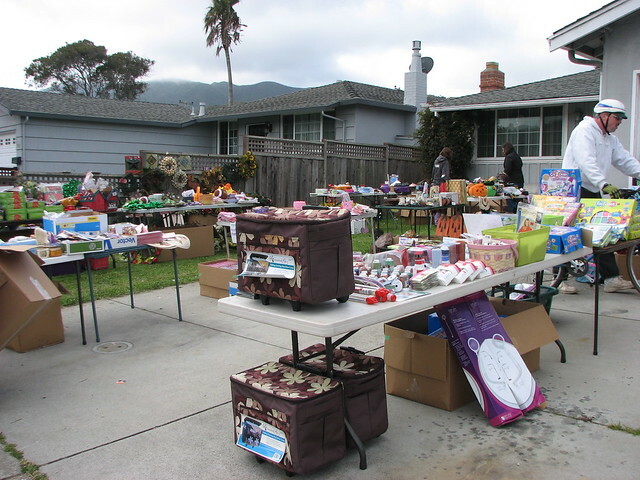 I thought I would pass along some of our tips and tricks for putting on a good garage sale. First, your prep work is the most important part. And the most cumbersome portion of that prep work is pricing everything. Give yourself plenty of time to sort through all your stuff and price it. I highly recommend getting the round sale stickers with prices already on them. You can find them online or in just about any store in the office supply section. Another great option is to think about doing bulk pricing. For example, if you have a bunch of kids clothes in a bin you can just make a sign that says all pieces $1 or everything you can fit in a grocery bag is $5! That can help save a lot of time. If you’re not sure what to price things – hop over to your local Goodwill, do a spin around the store and take some notes. You shouldn’t price anything higher than what you see there, unless it is really nice or brand new. I would stroll thru with an idea of what you have for sale and make some general notes. For instance, if you have books see what price they have on paperbacks and hardbacks. Normally it is a consistent price. Once you have your shopping intel, I would go slightly under the prices you saw there. Remember people who yard sale know when something is over priced. Of course they will also often will always bargain, so put a little fluff in but not too much. I find that I will spend more money and purchase more items at a yard sale where things are priced low than if they price high. And your goal here needs to be to move volume and get rid of junk! Before the sale – make sure to stop by the bank and get some change. You will want to have at least $80 in change available (I get 4-$10s, 4-$5s, 15-$1s and $5 in quarters) or more if you have bigger higher priced items. I normally grab our penny jar for dimes and nickels and pennies. But if you don’t have one of those it is probably good to get a roll of nickels too. Think like a store – you want to have things “merchandised” if you will. Organize by category (kitchen stuff, books, clothing and decorative things) and try to get as much stuff up on tables as possible. If you have a local senior center, church or community center stop by and ask if you can borrow some tables if you don’t have enough. For clothes, the more stuff you can hang up – the better it will sell – so if you can run a clothesline or have a shower curtain rod you can suspend somewhere that will be great. I love the idea below of creating great tongue in cheek signs! Remember, people love to browse and if you give them a reason to check out each section they might be more likely to buy! Make sure list your sale on Craigslist.com. 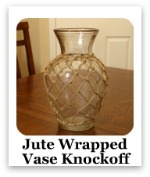 If you have some really good stuff, take some pictures to post with your Craigslist ad. You also need to make sure you put signs out directing people to your home. Your signs need to be bright, list the date, the address and lead people from a main road to your home with a sign or arrow at each intersection they come to. I hate getting to a neighborhood, turning in and having NO idea where to go from there! Even if you put the address on the sign, it is hard to read that from a moving car. People will be more likely to arrive at your sale if you give them a path to follow! 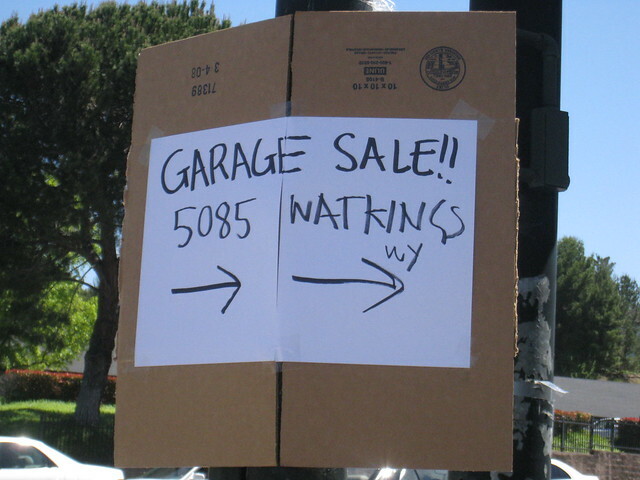 The Yardsale Queen did a great post on how not to do garage sale signs. Finally, on the day of get ready for people to be out early! And by early I mean like 7am. Be friendly and have a checkout area set up. I like to have a box for the change, a calculator, and a pile of grocery shopping bags that you can hand out to people who have a lot of stuff! By the time you get to 10:30-11:00 am consider putting up a sign in front of your house that says “Everything is 50% off!” since that is the time that traffic dies down and you will need to move it then or risk losing the sale! Better to get 50 cents for something than just take it to donation after that. Plus, if you do that, lots of people will buy more stuff, so you end up making just as much money and getting rid of more stuff. 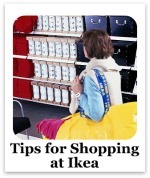 I hope these tips were helpful - but I am sure I have left some out! 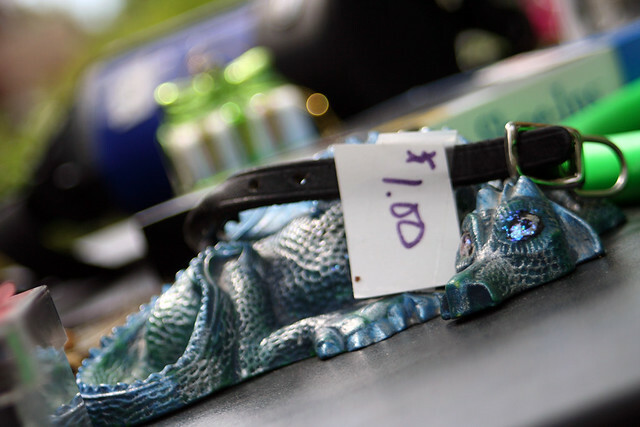 What are your best tips for a successful yard sale? If you are a regular yard sale attendee, what are your likes and dislikes? I wanna know! For most of us, there is one room in the house that could use a little more usable storage instead of just being a junk pile. That room is the garage. Right now - we have managed to keep ours to the point that we can at least still get both cars in there. However, that precious space is being threatened by an incoming flow of stuff and projects! So we are getting ready to do a clean up and organization of the area which had me online looking for storage ideas. Of course - I feel an obligation to share with you guys! Here are eight great garage storage accessories that you can use in your own home to get some of that clutter off the floor and into a proper place! For starters - I know my spray paint can collection that I am starting would be a lot more functional stored in something like this. 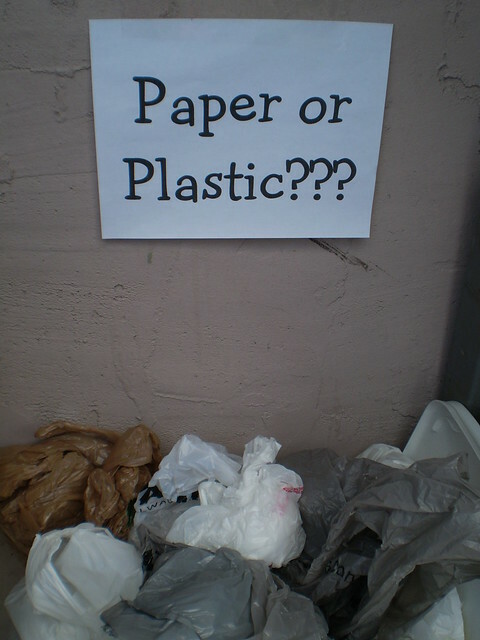 We need something more functional for keeping our recycling in. 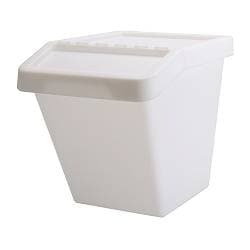 I really like these stackable bins from Ikea. 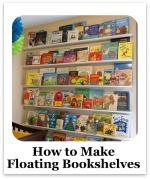 We also really need some shelving. I am digging this set that is low enough to go under our bike mounts. Speaking of bike storage I like this one! it folds up flat to the wall when you aren't using it and has a little shelf for accessories! Always need a place for those garden tools rather than just having them piled up in a corner or leaning against the wall. I also love that it has a removable basket so you can tote it around with you while you work in the yard! I like this lockable hook for hanging heavy duty tools like weedwackers. 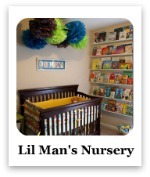 Keeps them from being "lifted" from your garage or the kids getting into them. And this is just brilliant. It is a magnetic bin! Keeps all those little screws and nails in place! And it is portable so you can tote it around with you for all your projects. Love it! So what about you, is your garage in need of organization? Have any garage organization tips to share? Lemme know! I know I have said it before - but Chalkboard Spray Paint in a can has to be the coolest thing ever invented. But it is also kinda expensive (well compared to regular spray paint). Normally it runs about $7 a can. Obviously, you want to maximize that investment and use it on as many things as possible! So what all can you turn into chalkboards? Any smooth surface! I have complied a list of 9 things that you can spray to your hearts content to create that great chalkboard effect! I know you remember my cardboard chalkboard project. I just used the cardboard from the back of the frame of this mirror to make my chalkboard! 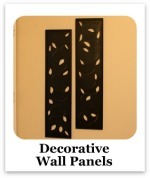 You can also use cardboard to make chalkboard labels like these from Rachelle @ Fingerprints on the Fridge! 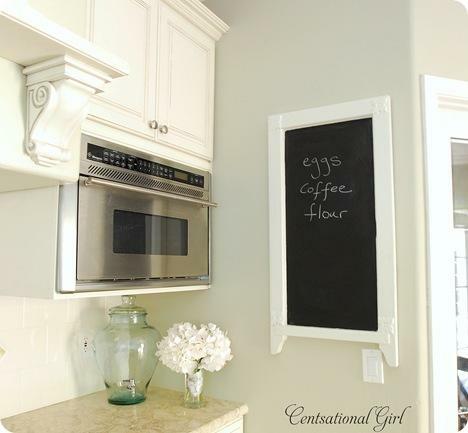 So Kate @ The Centsational Girl did this adorable redo of a mirror into a Chalkboard. Just sprayed right on top of the mirror. But you can do both sides of a mirror. 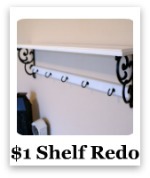 How adorable is this medicine cabinet redo from Jamie @ Red Roof Blue Door? She just spray painted the inside of the door with chalkboard spray paint! Perfect for notes and reminders! Yes - you could spray paint the inside of a medicine cabinet like the above, or you could take an old cabinet door and make it into this beautiful message board. That is what Nell @ Wranglers and Ribbons did! Sure I have seen projects where people just spray painted the glass in frames - but lets take it to the next level. How adorable are these little spray painted votives? These are from DIY Bride. 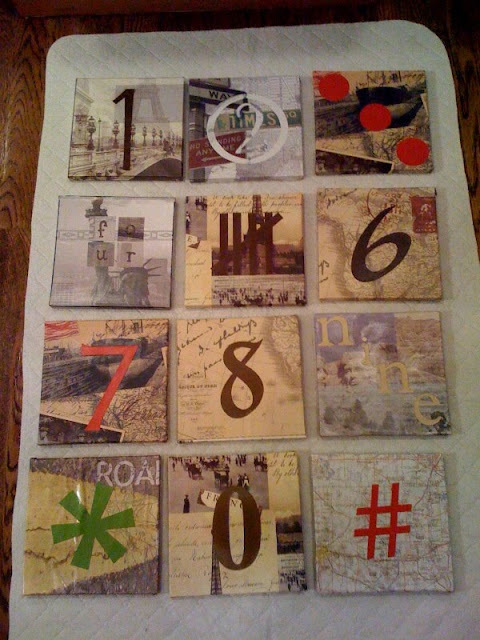 Love this tabletop redo by Julie @ Less-Than-Perfect. BTW - the post is touching and hysterical! I highly recommend reading it! Let's just say that a good BFF is a great thing to have! Spray painting metal is a great idea. I love these PB Knockoff Garden Tags that Kristen @ Restored Style did! At about 90% off the price of the PB ones I think these turned out fantastic! Yep - I went there. Silverware! Of course you can't eat off it but it also makes adorable garden markers. See how you can spray paint silverware by hopping over to Christy @ From Glitter to Gumdrops. Terracotta planters have never been cuter than when done up with Chalkboard! Love these bright planters that Tyna and Katie @ We Heart This did! 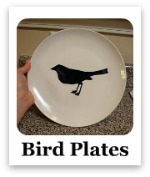 This PB Knockoff Platter is a great example of how you can spray paint ceramic. Emily @ The Rubber Pumpkin did this one! Love it! There you go! Feeling inspired? I know I am! So what do you want to run out and spray right now? Got a project you want to share? Link it up in the comments or hop over and share it on my Facebook Fan Page! You can add it as a link or upload pictures! I know we would all love to see it! I just remembered that I promised you guys a summer update on my patio! For those of you new to the blog this is what our patio looked like before I started on it. It was the world's smallest concrete slab! Isn't it just pitiful? So I built some planter boxes and turned it into this fantastic private book nook back in May! But my Mandevilla have grown up a lot so here is a updated look at the patio! It has been a little too hot to enjoy the patio a lot over the summer. However, on some days when the sun has gone over the house and it isn't too humid, I can sit out there with some Caribbean music on my Ipod, read and pretend I am miles away! There are several projects that went into this patio. 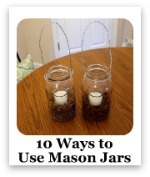 My PB Knockoff Mason Jar Lanterns - everyone asks if those are coffee beans in the bottom but it is just aquarium river rocks! And finally my No Sew Outdoor Pillow - I am so obsessed with quatrefoils! What about you? Do you have a favorite outdoor space that has just grown up beautifully over the summer? Or have you read any good books I might want to put on my list? Lemme know! P.S. I am looking for guest posters as I will be out of town on and off for the next couple weeks! 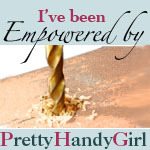 Send me an email if you are interested in guest posting. Hey guys! 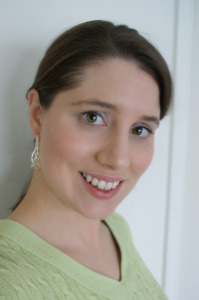 I am guest posting today over at Strictly Simple Style with Karen! Do you know Karen? If not you are just going to love her! And since I know you are all in the mood for fall decor, last year she did these fantastic pumpkins. Nailhead trim on pumpkins! The woman is a genius! So hop on over! I have a post up on some great "dorm" deals to steal for your home! It was slightly cooler out this morning! Made me start yearning for a little crisp fall weather. It sure would be a nice alternative to this oppressive heat! 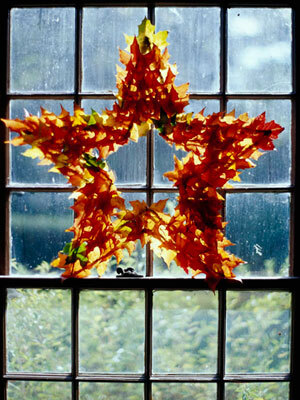 Of course, when I start thinking about fall - I start thinking about fall decorating. (Admit it - you have too!) So as I was flipping around looking at pics and ideas for decorating the front door just kept jumping out at me! 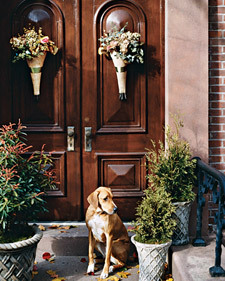 So here are some inspirational ideas to give your front door that fall feeling! 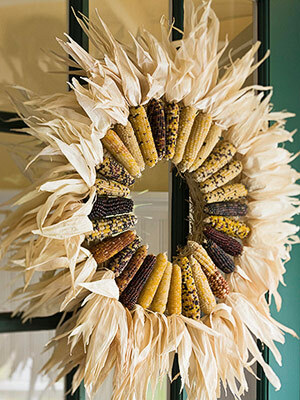 Love this corn garland from Martha! When I first looked at it - I thought it would be so complicated. Nope! It just uses gravity! That Martha - always thinking. Who would have thought kale could be so beautiful? There are hanging baskets and planters featured on this patio. Love it! Go here for the step by step slides on how to recreate this look. I love the idea of a U-shaped Horseshoe Wreath. This one is especially beautiful with wheat grass. 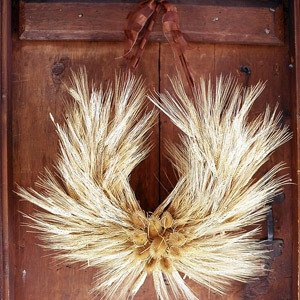 How beautiful are these cornucopia inspired woven door arrangements? Indian corn and a glue gun! 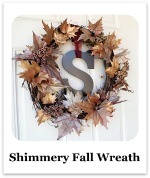 That is all you need to make this beautiful wreath! Have some corn left over? You could make this beautiful swag! Adorable! I love the idea of using different shaped wreath forms to make wreaths. This star shape is amazing! 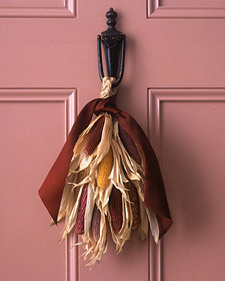 So there you go - hope you have a little fall inspiration for your front door. Now tell me - which one was your favorite and are you looking forward to fall too? 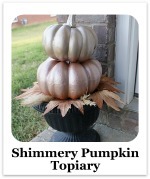 Also linking this up to the Impromptu Fall Decor Party with Sarah @ Thrifty Decor Chick! Head over and join the fun! 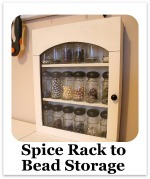 Last week when I showed you my spice rack to bead storage redo - I asked for you to please ignore the flower print sitting up on my shelf. I got it for a $1 back in May and wasn't sure at the time what I was going to do with it. I mean - don't get me wrong - it is adorable but not really my style. 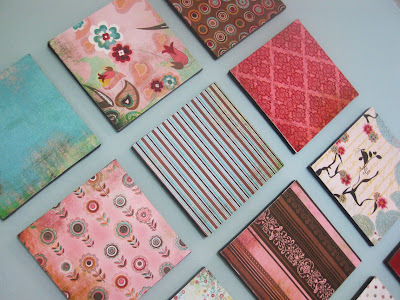 So last week when I shared the pics with you guys, I had already decided to make one of those fabulous dollar store art print redos that everyone has done around blogland! Like Carol @ Frugal Life Project. Or these that Tricia @ Hicks in Hendersonville did which I LOVE! Tricia's basically like a neighbor to me - she just lives down the road! 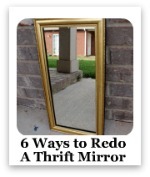 We are going thrifting one of these weekends! So are you ready to see mine? Well for starters, I took my little flower print canvas and painted the edges black since the print overlapped around the edges. 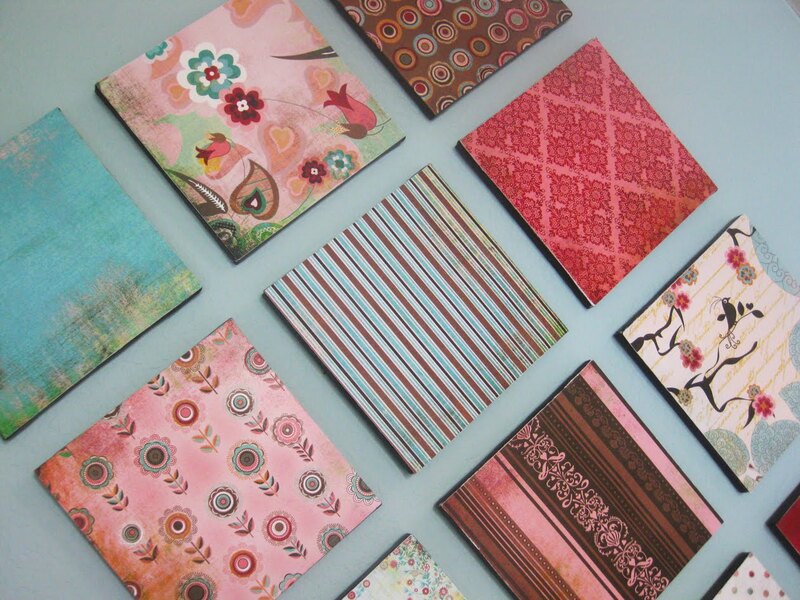 Next up, I grabbed the mod podge and put this adorable piece of 59 cent scrapbook paper and decoupaged it on. So here you have it! In 15 minutes you can have a customized piece of art for $1.59! Perfect addition to my lovely shelf! I think it looks great over my craft station! You have to try this out for yourself! It is super easy and takes no time! Would you do multiples like Carol and Tricia or just do one? I would love to know! And if you have done your own art project like this, link it up over on the Frugal with a Flourish Facebook Fan Page! I know we would all love to see it!